Mulch is a layer of material used to cover the surface of soil to conserve moisture, improve land fertility and to reduce weed growth. Biodegradable mulch films are used in an eco-friendly manner to carry out agriculture with limited arable land to enhance crop quality by maintaining temperature. The global biodegradable mulch films market is poised to grow approximately at 7.6% CAGR during the forecast period. The growth of global biodegradable mulch films market can be attributed to factors such as depleting arable land with growing population and increased government regulations promoting usage of bio-based products. The key players in the market are investing in R&D to develop fully bio based mulch films. The lack of availability of such mulch films and high initial cost are the major restraints to the market growth. BASF SE (Germany), RKW SE (Germany), AL-PACK Enterprises Ltd. (Canada), British Polythene Industries PLC (U.K.), Kingfa Science & Tech Co. Ltd. (China), BioBag International AS (Norway), AEP Industries Inc. (U.S.), Armando Alvarez (Spain), Novamont S.P.A. (Italy)and AB Rani Plast OY (Finland) are some of the leading players operating in this market. 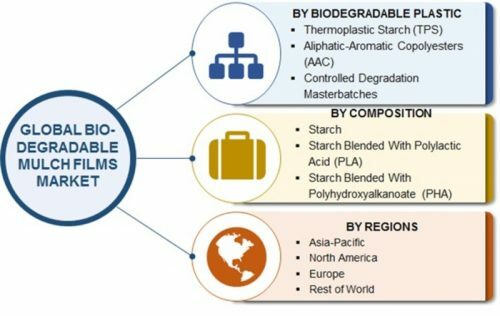 Asia Pacific dominated the global Biodegradable Mulch Films Market and accounted for around 60% of the market share in 2015. The rising population has increased the demand of food in the region, which in turn drives the biodegradable mulch film market. It is followed by Europe, where the increasing adoption of bio-based products is expected to drive the market. During the forecast period, the region is expected to witness moderate growth.